“I’D HAD SMALL SETUPS in the past but this was the first time I had built what I would call a “proper” studio. The main aim was to have a great writing space but I also wanted the studio to have the capability of recording a full band if necessary. 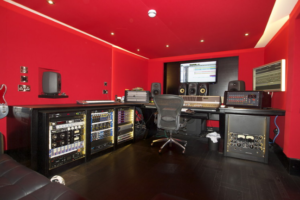 We had a small wine cellar for the control room and a triple garage for the live room. I’d always imagined that it would be fairly cramped, but in the end the studio was fairly spacious. I used a company called Studio Creations, who were very thorough about the planning stage. They wanted to be sure that we were all on the same page before they started the build, so we had many meetings discussing technical requirements. We spent a good few months ironing out the options before the building work even started. To be honest, the eventual build process was relatively painless. It took about six months and the guys were pretty invisible. I had mainly worked with Pro Tools on my laptop and was relatively inexperienced with the technical side of things, but I got 24/7 technical support [from Studio Creations], which was essential. I do most of my vocal stuff at home. Doing vocals is the most painful process of recording and it’s great to be able to do it in the comfort of your own home. I try not to get caught up in the technical side of stuff, and look at the studio as a creative tool. The most important thing to me is having a great collection of microphones. Although I love vintage stuff, I didn’t want to have too much of it in the studio as it has a tendency to go wrong.